One done... only 47 to go. The scale of things is unbelievable. Bigger than Texas. Well, when you look at it that way ...! Hope it all went smoothly. How huge !!! Is this only one machine with many rear wheels? Yes one machine. It is a disc seeder that is used to sow crops. You can only see a quarter of the wheels in this photo. There is another row behind the row you can see. Those two rows make up half of the machine. The other half is behind me. Cool perspective...and I hope that all went smoothly. Looks like a big chore. Have a super day! 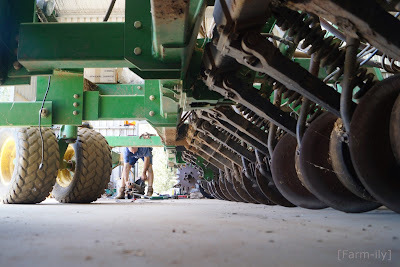 Yes, many days work to change all the discs and ready it for this season's sowing. Wonderful perspective...if I had got down to take that someone would have had to help me get up! And I was thinking of how the back would feel after completing them all. Farmers work is never done, and he's to be a jack of all trades.